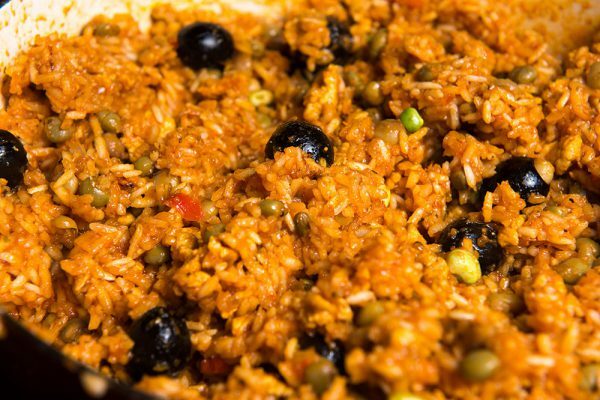 Learn how to make delicious Arroz con Gandules! Bring gandule to first boil; drain in colander and set aside. Slice pork into thin, short, narrow strips. Chop onions. Fry pork with onions, pepper and garlic. When almost done, add pimiento trip (optional). Add can of tomato sauce and allow to simmer uncovered for a few minutes. Add chopped green onion, cilantro, gandule, broth and uncooked rice and add salt to taste. In a separate pot melt 1 Tbsp. achiote seeds in 1 Tbsp. Crisco. Strain seeds; add colored Crisco to other ingredients. Bring mixture to a boil then lower heat and place foil on top, folding in the edges. Place pot lid on foil. Simmer until rice is dry.